UPDATE: Please click here to read my post on how Tide Pods made us itchy & gave my toddler a rash. 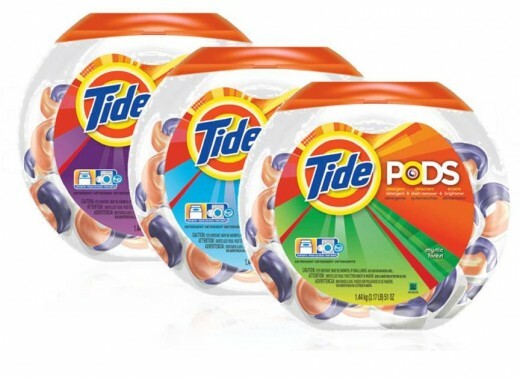 As the name suggests, the detergent is packaged in individual pods. You just toss one into the washer with the clothes as you would any other detergent. Why is it good (or not)? I tried a pod with a load of brightly coloured clothes & it did the job. It was easy, but the time saved by tossing one pod in, as opposed to measuring one scoop or cup of detergent seems too minimal to justify the expense. I like to adjust the amount of detergent I use depending on what I'm washing. These pods don't allow that. Tide Pods are also not really a very environmental option compared to powdered detergent. They're heavy, since they're liquid inside a membrane, plus they take up a lot of space--the containers are round. Being able to fit less detergent per box, per truck, per shipping container means more fossil fuels have to be burned to move this stuff from the factory to you. As Tide Pods contain both a brightener as well as a stain remover & some surfactants I'm not sure about, this detergent wouldn't be suitable for washing cloth diapers. There also doesn't seem to be an unscented variety, so you're stuck with whatever Tide thinks your clothes should smell like--not a great option for those with allergies or sensitivities to artificial scents. I've only seen online so far, though I'm sure they'll be in every store that carries laundry soap if they aren't already. $20 for a package of 77 pods. *I received a free package of 14 Tide Pods from Procter & Gamble & was asked to write about them through their blogger outreach program. We used tide pods for the first time to wash linen. This morning my daugher woke up with rash all over her body and face. We had to take her to the emergency room. Luckily she is ok now. We took off all the sheets and clothes we washed to tide pods and re-washed them using what we used before. I have been using tide pods for a while. The other day I washed my clothes and after I took them out of the dryer I noticed a piece of plastic melted in the groin area of my boxers. Thinking nothing of I pulled the plastic off and wore the boxers. The next day the skin around my scrotum area was hard like leather. After research I found this may have been caused by the not properly dissolving. I just put some ointment on there today and hopefully this cures cause this painful. Put the pods in the machine first then the clothes.